The Villa of Livia (Latin: Ad Gallinas Albas) is an ancient Roman villa at Prima Porta, 12 km north of Rome along the Via Flaminia. It was probably part of Livia Drusilla's dowry she brought when she married the emperor Augustus, her second husband, in 39 BC. It was her country residence complementing her house on the Palatine Hill in Rome. Its Latin name, Villa Ad Gallinas Albas, referred to its breed of white chickens, but it was also famous for its laurel grove, which was said by Suetonius to have auspiciously omened origins. The location was strategically important due to the iron-rich cliffs of red tuff that approach the river at this point, the confluence of several roads and the northern entrance to Rome. The name Prima Porta (First Door) came from an arch of the aqueduct over the Via Flaminia that brought water to the villa and which travellers saw as the first indication of having reached Rome. The villa occupied the height dominating the view down the Tiber Valley to Rome. Some of the walling that retained its terraces may still be seen. The Villa was built and modified in four stages, the earliest of Republican date, the latest of the time of Constantine the Great. The site was rediscovered and explored as early as 1596, but it was not recognized as the Villa of Livia until the 19th century. In 1863/4 a marble krater carved in refined low relief was discovered at the site. In 1867 the famous heroic marble statue of Augustus, the Augustus of Prima Porta, was found: it is now in the Vatican Museums (Braccio Nuovo). The magisterial Augustus is a marble copy of a bronze statue that celebrated the return in 20 BC of the military standards captured by the Parthians in 53 BCE after the defeat of Crassus at Carrhae. In the 19th century, the villa belonged to the Convent of Santa Maria in Via Lata. The villa and gardens have been excavated and can be visited. 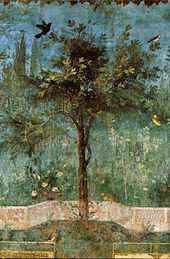 From three vaulted subterranean rooms, the largest contained superb illusionistic frescos of garden views, where all the plants and trees flower and fruit at once, which have been removed to Rome where, following cleaning and restoration, they have been reinstalled in the Palazzo Massimo. The vault above the fresco was covered with stucco reliefs, some of which survive. A new series of more meticulous modern excavations was initiated in 1970. More modern scientific work began at the site in 1995, carried out by the Soprintendenza Archeologica di Roma and directed by Professor Gaetano Messineo, in tandem with the Swedish Institute in Rome. ^ Robert Piperno, "A Walk to Malborghetto"
^ F. Nardini, Roma antica IV, Roma 1820, p64f. ^ Gaetano Messineo (2001). Ad Gallinas Albas: Villa di Livia. L'ERMA di BRETSCHNEIDER. ISBN 978-88-8265-167-1. ^ "Painted Garden, Villa of Livia". Smarthistory at Khan Academy. Retrieved February 11, 2013. Wikimedia Commons has media related to Villa di Livia (Rome). Carrara, M. (2005). "La Villa di Livia a Prima Porta da praedium suburbanum a villa Caesarum". In B. Santillo Frizell and A. Klynne (ed.). Roman Villas Around The Urbs: interaction with landscape and environment. Proceedings of a Conference at the Swedish Institute in Rome, September 17-18, 2004. Rome. Calci, C.; G. Messineo (1984). "La Villa di Livia a Prima Porta". Lavori e studi di archeologia. 2. Allan Klynne and Peter Liljenstolpe. "Where to Put Augustus? : A Note on the Placement of the Prima Porta Statue." American Journal of Philology 121.1 (2000) pp. 121-128. Robert Piperno, "A Walk to Malborghetto"
This page was last edited on 30 October 2018, at 18:17 (UTC).